high degree of task-level parallelism among computational kernels. peak throughput of one data word per cycle. to be highly reliable and efficient. 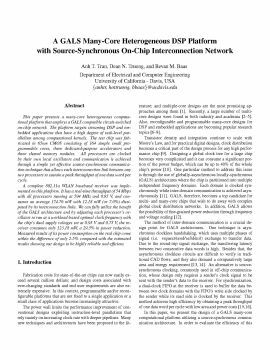 Anh T. Tran, Dean N. Truong, Bevan M. Baas, "A GALS Many-Core Heterogeneous DSP Platform with Source-Synchronous On-Chip Interconnection Network" ACM/IEEE International Symposium on Networks on Chip (NOCS), May 2009, pp.214-223.